I drove from Massachusetts to Colorado in two and a half days, towing the BMW on a car trailer with my Honda Odyssey minivan. Towed weight was about 3800 lbs including car, trailer, and tools and tires. Another several hundred pounds inside the van, all up weight close to 9000 lbs. Driving to Colorado at about 75 MPH, the Odyssey averaged 15.3 MPG. Driving from Colorado to Massachusetts, the Odyssey averaged 18.9 MPG. Arrived in Colorado on Monday morning, worked at Mitch William's shop to fix up a few minor items on the car, then to Mitch and Alissa's house to get vinyl graphics cut. The car now looks more like a race car! Drove to the Lone Duck Campground on Route 24 just near the Pikes Peak highway road. Got to sleep around midnight. I also picked up a cold which meant I was sick all week for practice and still sick on race day. 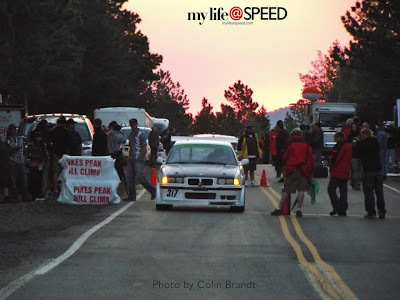 I had not looked at the Pikes Peak road in person yet, so Tuesday morning I drove the road in the van. A pretty amazing road and the scenery was just outstanding. Hurried down the mountain at slow tourist speed, got to the campsite by noon and towed the BMW down to Pikes Peak International Raceway which is about 40 minutes away. Arrived just in time for registration and tech inspection for Time Attack. 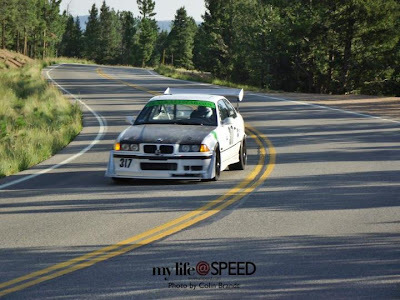 Rookie orientation was uneventful; an experienced Pikes Peak car racer gave a very good overview of the tricky sections of the course. The motorcycle racers got their own overview from the bike perspective. We get up at 2:45 AM for practice, gates open at 3:30, practice starts at 5:30. Funny seeing the 20 MPH signs on the right when you blow by at 5x that speed! Today was practice (and qualifying) on the lower section, from the start line to just below Glen Cove. My first run went very well, no mistakes, and felt pretty fast. I again surprised myself and placed fourth in Time Attack. On my second run, I went off the road at the Sump, three corners before the end of the section. The back of the car stepped out rapidly (oversteer) and I tried to catch it but the rear wheels slid into the ditch. The car rotated and ended up facing downhill. I managed to get it out of the ditch without having to red flag any cars. After looking over the video, I believe the reason I spun so rapidly was because the left rear tire was on the double yellow lines, which are extremely slippery. The bike riders had talked about this but I didn't think it would affect the cars so much. Most of the damage was to the exhaust. Much thanks to Cyrus who cut out the exhaust at the middle of the car and welded on a little section to point at the ground. Thanks also to Jimi and TK for getting the welder for us and helping with stuff. The car was fixed up ready for Friday practice, a little louder, a little lighter, and a little more bent! I had worried a lot about not qualifying, since the Time Attack field is almost exclusively turbo cars. But my first run was good enough for 7th in Time Attack with a time of 4:44.338 so I'm racing on Sunday! Day two of testing was held on the lowest section, from the start up to Glen Cove. When the cars started rolling in, I noticed a guy on the last corner with a radar gun. Curious, I walk over to go check him out after tire temps were done. 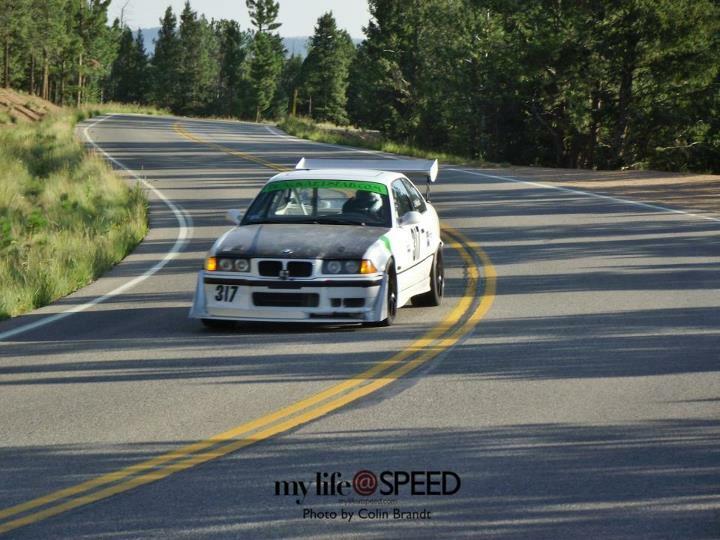 Brianne, Rhys, and Jamie Melhuish in his ’95 M3 were the last cars to come around. Out of curiosity, I ask him about the cars. So I posted the second-quickest speed through that corner out of all cars in Time Attack and Unlimited divisions (not sure about Open Wheel), only David Donner in the Palatov was 1 mph faster. 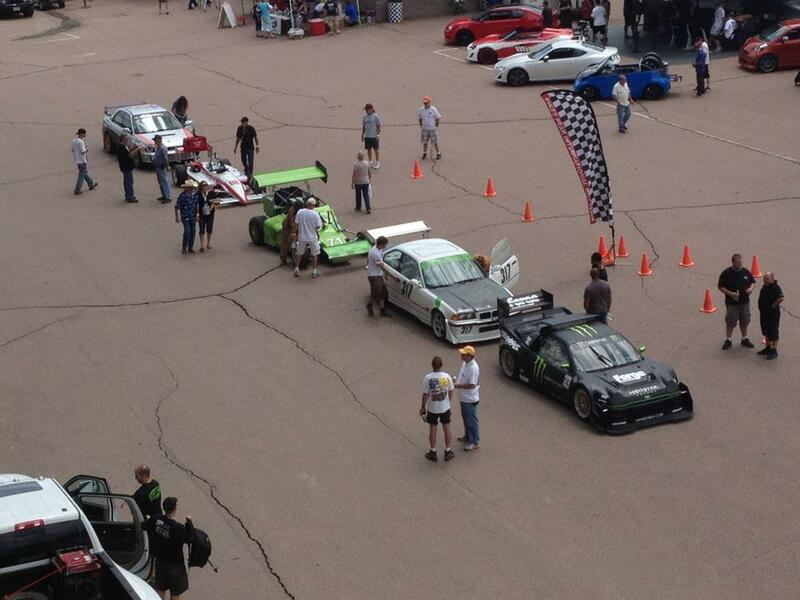 at Pikes Peak International Hill Climb 2012. Car has 246 WHP at sea level. Expect 200 WHP at start line and 136 at finish. Tires are 265/645 R18 Hoosier radial slick with single circumferential groove. Weight is about 2600 lbs without driver.